Fed up with an environment unconducive to learning and teaching, the Atlantis primary school’s School Governing Body (SBG) shut the school down on Wednesday, with parents threatening to set the school alight, saying its unsafe for pupils. 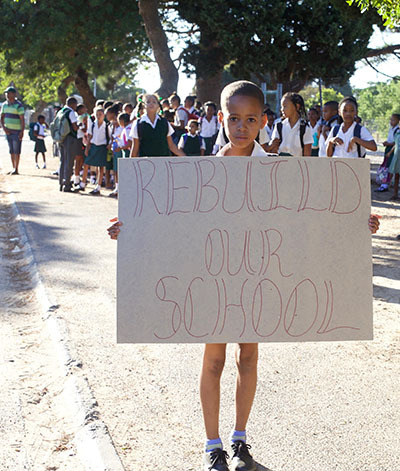 Parents and teachers from Avondale Primary school supported the SGB’s shutdown due to the school’s dilapidated state. 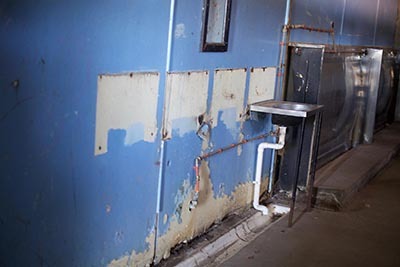 Huge holes inn the ceilings, enormous cracks in the prefabricated walls, broken window panes, broken toilets and other structural issues characterises the infrastructure of the 39-year-old Avondale Primary school which caters for about 1 000 pupils. Outside Eve Avenue in which the school is situated, about 500 pupils and 50 parents were protesting against the schools poor standards on Wednesday. The school’s entrance gates were locked at 7am while protesting pupils and parents carried placards that read: “rebuild our school unsafe building for kids”, “why can’t we have a new school” and “ Ons is gatvol”, among others. “We want the (Education MEC) to come and meet us to give us answers as to when they will rebuild our school. If the MEC will not meet us the shut down will be indefinite,” said SGB chairman Shane Jennicker. Jennicker said the indefinite shutdown will not disadvantage the pupils as when the school reopens educators have committed to work overtime to catch up on lost school days. “The school have been left to deteriorate for many years. Enough is enough,” he said. Irate parents said most of them went to the same school from back in 1976 and insufficient maintenance has been done since. “We want a new school infrastructure. The current infrastructure is decaying. In winter the classrooms are soaking wet, in summer it’s terribly hot. There are no gutters. No ceilings. It is unsafe for our children,” said Karen Dirks, a mother of two children aged six and 10 who attended the school. Channel Broom, 24, a wife and mother of two children aged three and seven, said like other parents, she was disappointed to see the oldest school in the area being neglected. “The school is actually becoming unsafe for pupils and teachers,” said Broom. “We are gatvol. My child can’t go to the toilet cause other pupils’ feaces are full in the toilet with no water. Our children have to keep their urine during the duration of the school day and wait to urinate at home. We will burn it down,” said Rene Careson, 43, a mother of a child in Grade 4. School principal Michael Scholtz said it was the parents’ and the SGB’s decision shut the school down. He agreed the school is in bad state. “It’s not conducive for learning and teaching. Everything is falling part. It’s decaying. There is no playing ground for children and now in summer it’s extremely hot in the classrooms making it difficult for teachers to teach in extreme heat and for learners to concentrate,” said Scholtz. Education MEC Debbie Schaffer’s spokesperson Jessica Shelver said the department’s officials met the irate community representatives on Wednesday. “Officials from our infrastructure department met and discussed the possibility of adding the school to the UAMP for the 2016/2017 financial year. This is possible, however, one does need to be cognisant of the severe budget constraints we are facing due to the unions negotiating an above inflation wage increase in 2015,” said Shelver.